It is located in the middle of the Corsican mountains, in the village of Cozzana situated on the high Taravo, that Dumè Cesari rears his pigs and manufactures a variety of delicatessen products. The making of charcuterie is a family tradition for the Cesari family. At a young age, Dumè has immersed himself in the world of charcuterie ever since his parents started a farm in 1980. His techniques are imbued with ancestral knowledge, being the same as those that his grandfather and father had used before him. Dumè ‘s younger brother, Jean Joseph, helps to sell their products everyday in the markets of Ajaccio. The pigs reared by the Cesari family are bred in the wild. They are fed with cereal and barley flour in the summer, and wild acorns and chestnuts during the winter. 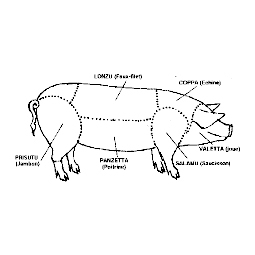 These rearing methods explain the excellent quality of the charcuterie and its unique taste. The slaughter of the pigs, known as “la tumbera”, starts in November. The salting and drying processes follows after. The final refinement step is done in a natural cellar in the village and takes between 3 to 24 months, depending on the product. It takes time to make the best products possible. 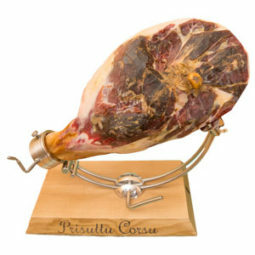 “Prisuttu” is the name of a dry Corsican ham, a noble product by excellence. Prisuttu belongs to the family of renowned Mediterranean hams. As done traditionally, the “Prisuttu” is buried in sea salt, free of any additives. 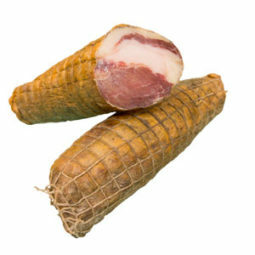 Its particularly sweet flavour, recalling a soft nutty taste, makes it a must-have when it comes to Corsican charcuterie. The maturing process is between 18 and 36 Months. “Coppa”, a Corsican loin of pork, rich in aroma and soft in consistency. It has a slight nutty taste due to the way in which the pigs are fed. 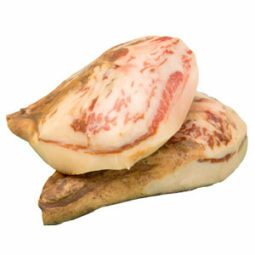 Corsican coppa is dried and refined for at least five months. “Lonzu”, Corsican pork tenderloin, is dried and matured for at least three months. Its consistency is creamy with a hint of hazelnut. It is a very lean product bound with 1 cm of fat that is similar to ham. 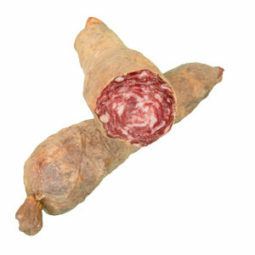 “Salamu”, Corsican saucisson, is madefrom carefully selected, denervated, red meat and. the only additives are salt and pepper. The preparation then consists of manually stuffing and placing it in a natural dryer. Valetta is the cheek of the pork. Salty and peppery, it is ready for consumption after twenty-five days of drying. Alternatively, it can be stored for several months in the cellar, in which case it can be eaten as is. This prime cut of charcuterie, with a unique and inimitable taste, can also be grilled. Figateddu contains pork consisting of lean meat, fat and liver. The latter is the essential component that gives it the name “figateddu”. Figateddu has a U-shape. It is intended to be eaten after roasting on an open fire, or raw after drying. Salcicetta is the corsican sausage. 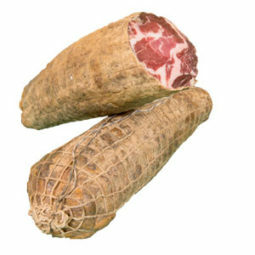 Only made with meat and pork fat, Salcicetta has a U-shape. It is intended to be eaten roasted in an open fire, or raw after drying.